Plastic Boxes To Keep Your Amiibos Safe. Because, Amiibos. 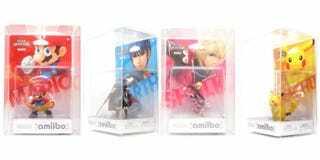 Were Amiibos ever truly designed as gameplay additions? You have to wonder. Surely Nintendo knew what would really happen: that hordes of video game nerds in their 20s and 30s would descend upon them like a horde of cashed-up locusts, buy all the good ones them keep them locked away forever. Which explains why this Kickstarter for Amiibo "collector cases" has already passed its funding goal. If you've got a mint-in-box collectible, you want to protect your investment! At $12 for a set of three, these cases will do that. They won't wipe away the tears of a child who just wants to play with a toy on his Wii U, and can never find the ones he wants, but you don't care about that anyway, do you. You monsters.